I had the great pleasure of working with the very talented Eric Daigle last week. His enthusiasm is contagious, and everyone feels it. Braiden and Kayla included. 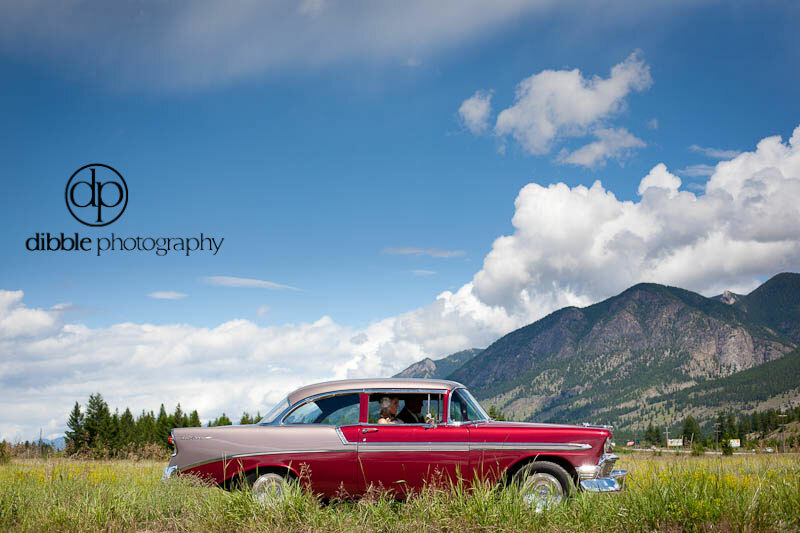 This lovely couple from Canmore came out to her dad's place on the lake in Invermere for a Canada Day wedding celebration that was a little bit country and a whole lot of class. There were a few things I loved about this one. First, I really am a sucker for the backyard wedding. There are some incredible venues out there, but there's something so classic, so intimate about turning your home into the venue. Love it. Second, classic cars are cool. A classic car purchased by the father of the groom when he was 16? Amazing. Third, Kayla has style. Oh yeah, and she's stunning. And lastly, everything flowed. This was thanks, in no small part, to the hard work of Jenna at Signature Weddings. As I think I've mentioned before, one of the things I love about second shooting is the opportunity to hang out with the guys. While Eric captured the lovely last moments of Kayla getting ready for the day, I witnessed a last minute line-dancing practice, documented the slickest of groom-worthy footwear, and saw Braiden keep his cool despite the heat.